Oh, to be able to bring this scene to life with the noise, the heat, the humidity. The acrid smells of rotting crops and fly-covered meat, the sticky black floor. This photograph is strangely calm, its subject lit as if upon a stage by the Caribbean light penetrating the glorious, rusting, metal roof, surely once a beautiful structure but now as filthy and rotten as its vegetable-strewn floor. After two days in a sterile, whitewashed hotel on a leafy hillside, I was eager to see what lay at the foot of the slope. Cap-Haitien is a pretty, colourful town, with “gingerbread” French-Caribbean architecture, palm-filled plazas and well-kept cathedrals and churches. 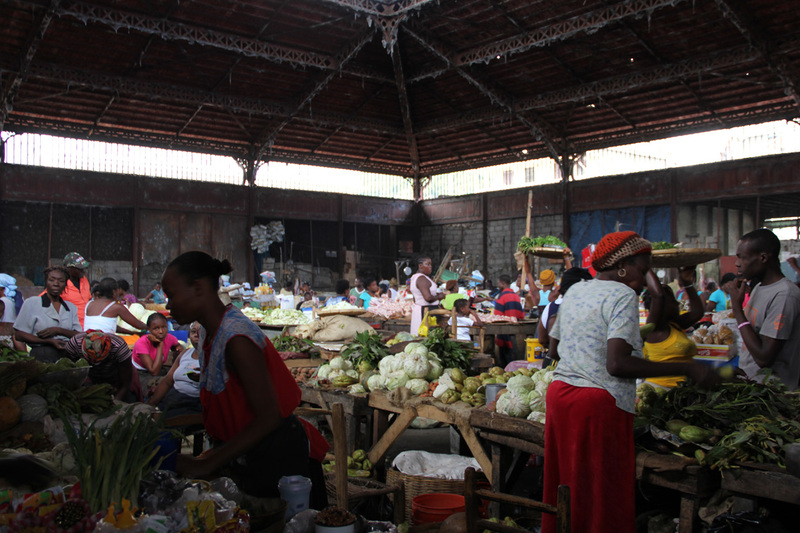 But this was the flip side, the daily market, the source of sustenance and trade for many of Cap-Haitien’s residents. Tags: Cap Haitian, caribbean, culture, food, Friday photo, Haiti, market. Bookmark the permalink.